How to add content from Vkontakte on my social wall? 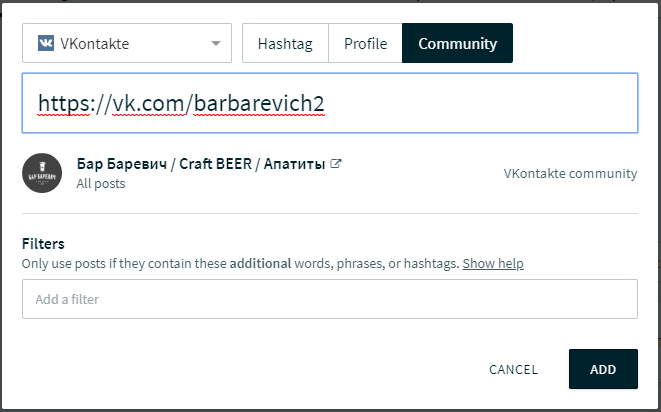 To add hashtag, community and profile content from Vkontakte as a source to your social wall, you first need to connect your Vkontakte account to Walls.io. To do that just go to Settings > Sources in your Walls.io dashboard and select Vkontakte. You will be prompted to connect your profile. Vkontakte will ask for permission to connect to your Walls.io account. Just click Allow to finalize connecting your Vkontakte account to Walls.io. This is something you only need to set up once. This is something you only need to set up once. 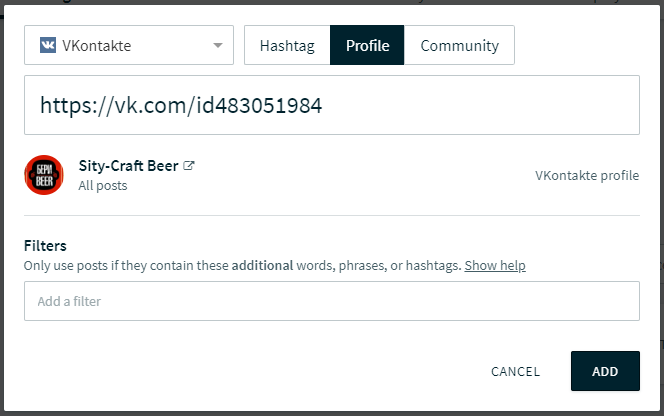 To add a Vkontakte hashtag as source to your social wall go to Settings > Sources in your Walls.io dashboard and select Vkontakte > Hashtag. 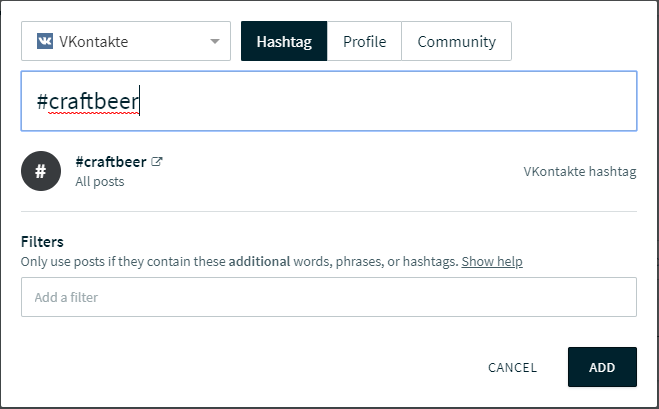 Then simply add the hashtag you would like to display content from and click "ADD". To add a Vkontakte profile as source to your social wall go to Settings > Sources in your Walls.io dashboard and select Vkontakte >Profile. Then simply add the URL of the profile you would like to display content from and click "ADD". You can add any Vkontakte public profile, not just your own. To add a Vkontakte community as source to your social wall go to Settings > Sources in your Walls.io dashboard and select Vkontakte > Community. Then simply add the URL of the profile you would like to display content from and click "ADD". You can add any Vkontakte public community.